SK Holdings has invested $100 million in California-based energy-saving smart glass manufacturer Kinestral Technologies, the Korean company said on Wednesday. The investment grants SK the right to buy up to 30 percent of the company’s stake and to manufacture and sell smart glass in China. 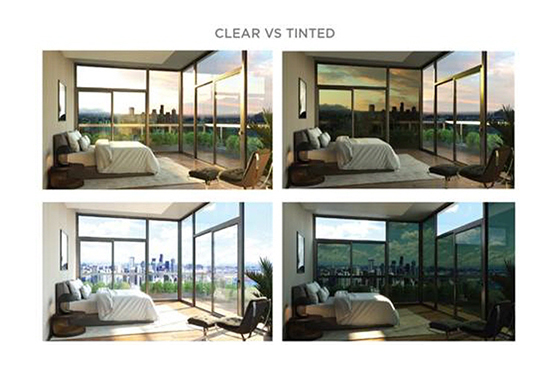 Smart glass uses electricity to control the color and transparency. It can block incoming light and heat by darkening glass color, saving energy consumption for heating and cooling by 30 percent compared to ordinary glass. The UV light can be almost completely blocked. These features make smart glass attractive to airports, hospitals and commercial buildings that seek alternatives for energy-saving and privacy protection. Facebook and Netflix are among those now applying smart glass for their headquarter buildings. Global market tracker Research and Markets forecast that the global smart glass market will grow to over $14 billion by 2026, and the growth curve will be sharper when it begins to be used in the automotive industry. Established in 2010, Kinestral is one of three global companies capable to produce smart glass and it has a competitive edge in tinting speeds, SK said. Kinestral began shipment of its products to large hospitals, exhibition centers and property developers in Europe early this year.